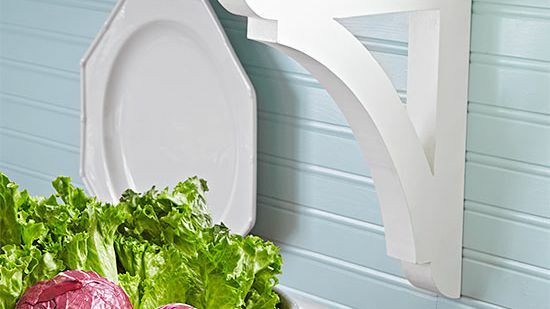 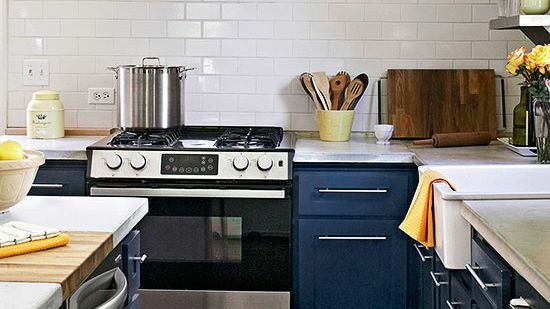 A few tweaks can give your kitchen a fresh new look. 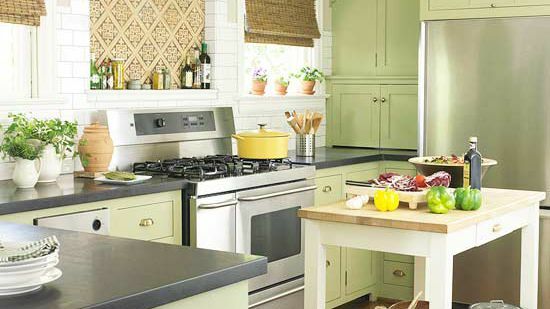 See how this kitchen combines cottage design and DIY style to create a cozy and modern kitchen. 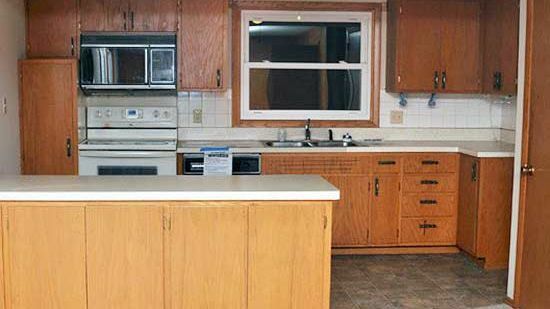 The kitchen in this 1950s Cape Cod was in sad shape. 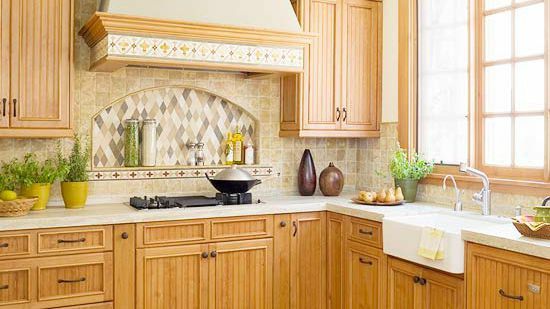 Brown cabinets were the same tone as the floors, which created a bland and dingy look. 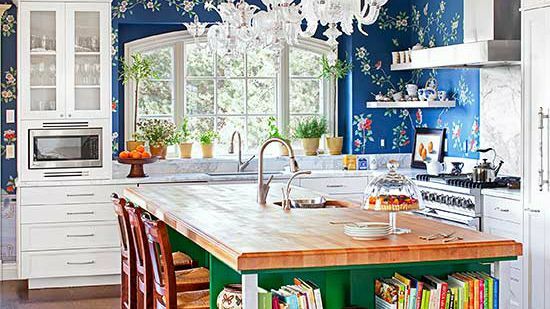 Smart design tricks and DIY solutions -- plus lots of paint -- restored this kitchen to a cozy cottage gathering spot. 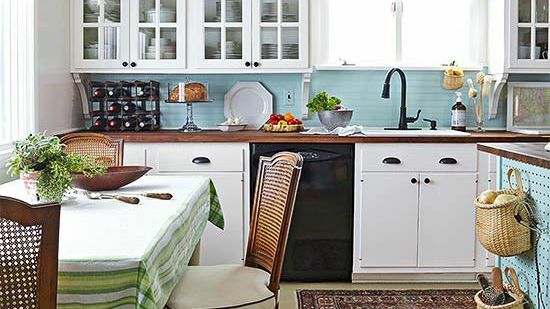 Soft blue and white paint brightens and unifies the newly renovated kitchen. 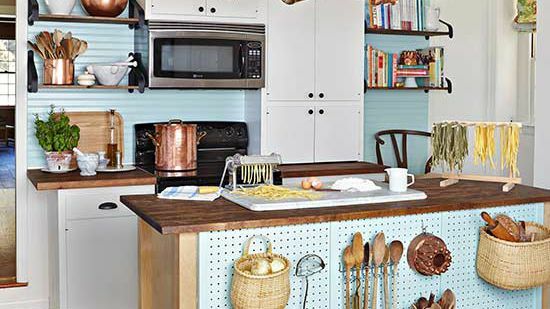 The existing island was replaced with a stock island, tricked out with a pegboard storage system and casters added to the legs to create a mobile workstation. 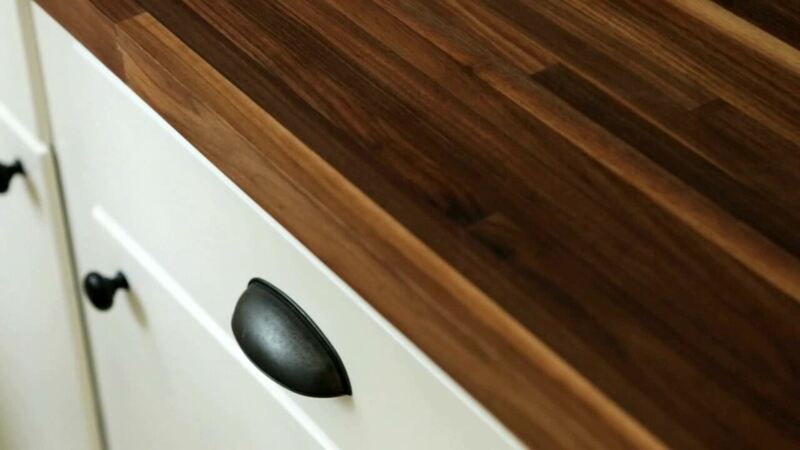 Rich walnut counters, found for a bargain at a flooring outlet, top the perimeter cabinets. 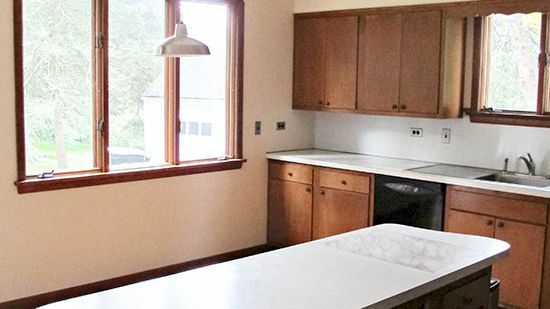 The island's butcher-block top was stained to match, unifying the kitchen's look. 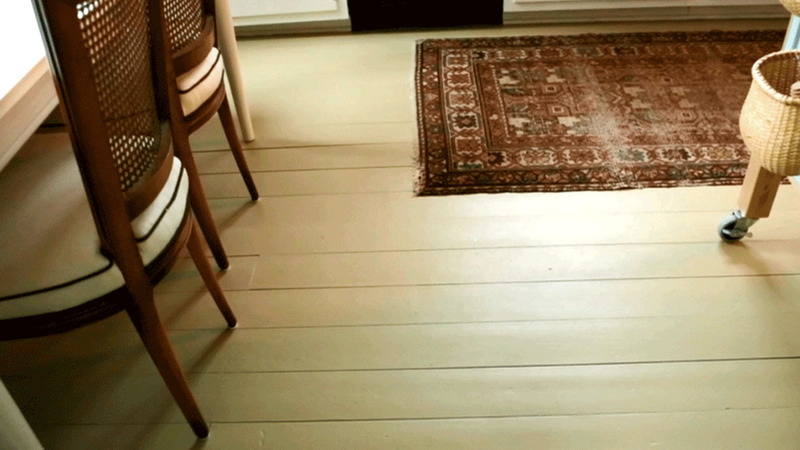 Durable porch paint in a warm khaki color covers the warped but solid wood floor. 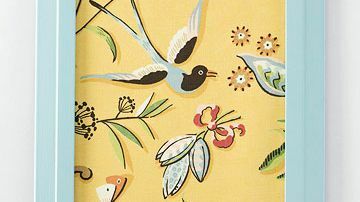 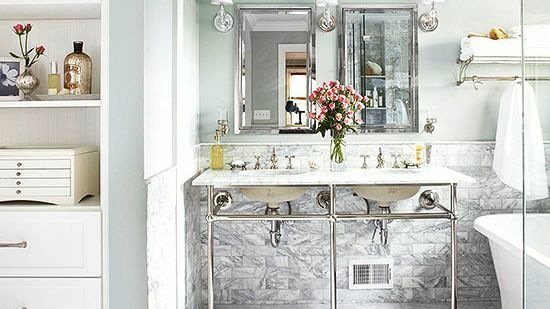 Learn how to decide whether you have a floor that can be painted and what materials to use. 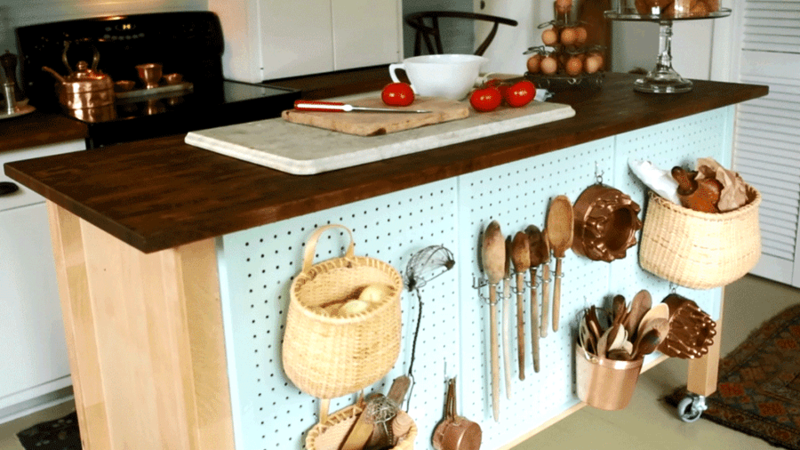 Inspired by Julia Child's kitchen, a pegboard storage system was added to one side of the new island. 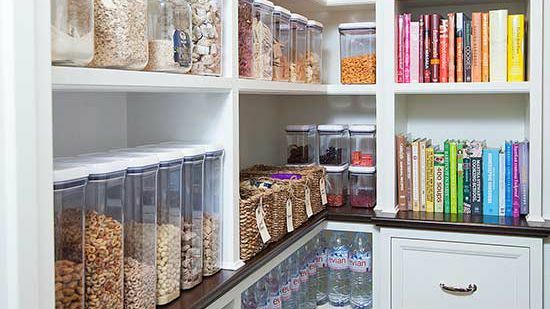 Paint and DIY storage take a standard island to an organized workhorse. 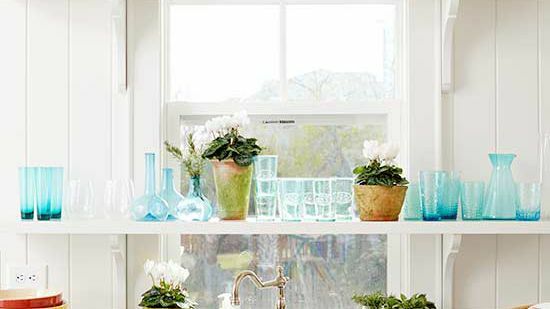 Bought at a flea market for $20, an old ladder makes a rustic pot rack. 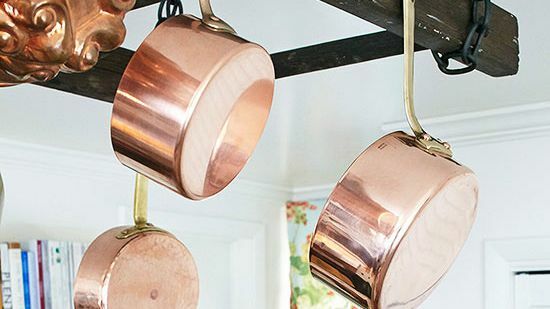 Pretty copper cookware hangs from nails along the side rails. 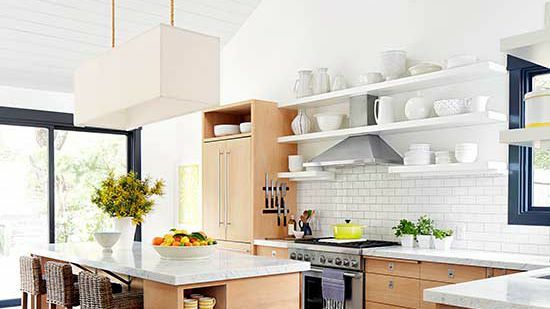 Open shelves keep cookbooks at the ready. 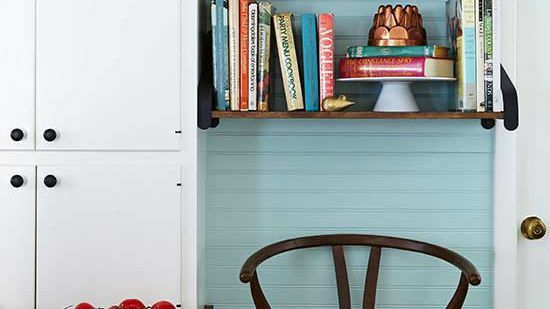 Below, a vintage chair offers a spot to perch while hunting for the right recipe. 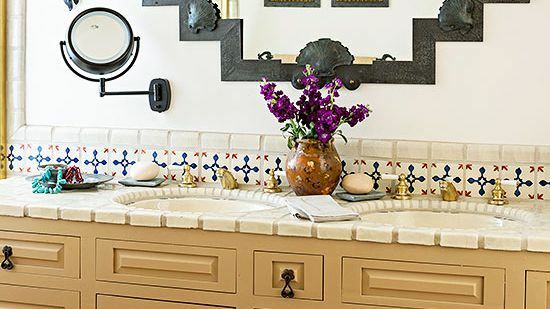 Painted beaded board wraps around the room, adding color and dimension. 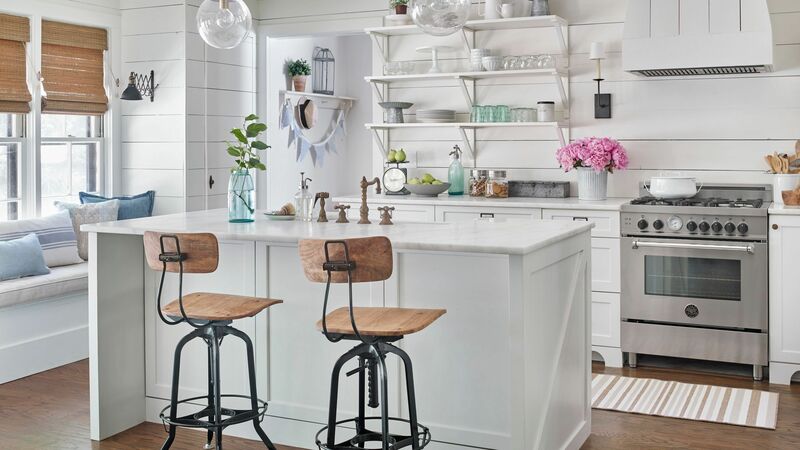 Beaded-board paneling painted a dreamy blue was installed horizontally on the backsplash for a fresh spin on traditional wainscoting. 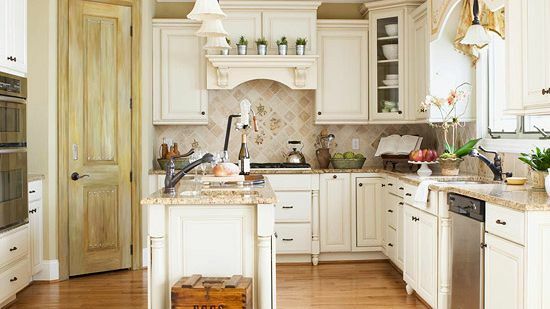 Six cabinet doors were replaced with custom glass fronts to lighten the look for a fraction of the cost of completely new cabinets. 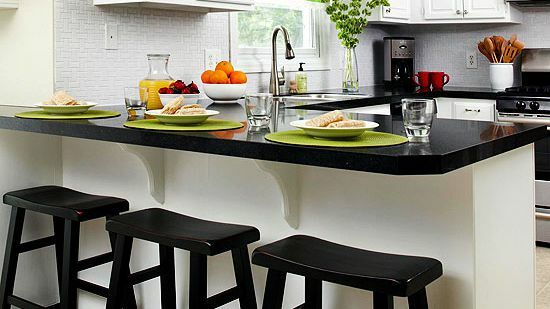 A set of secondhand chairs tucks under a freshly painted table against one wall in the kitchen, adding seating while keeping the walkway open. 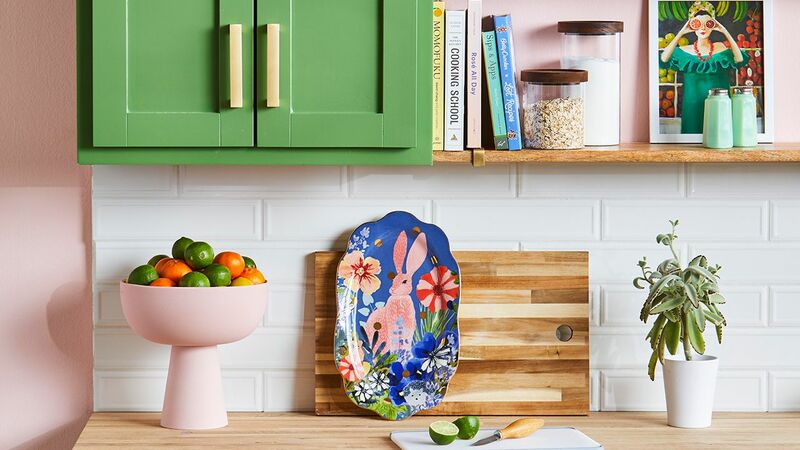 Learn how to paint your cabinets and get a professional look. 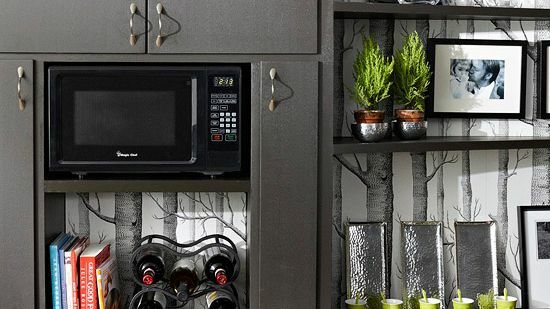 Brackets mounted under the wall cabinet create the look of a hutch, another small detail that adds up to big style in this kitchen. 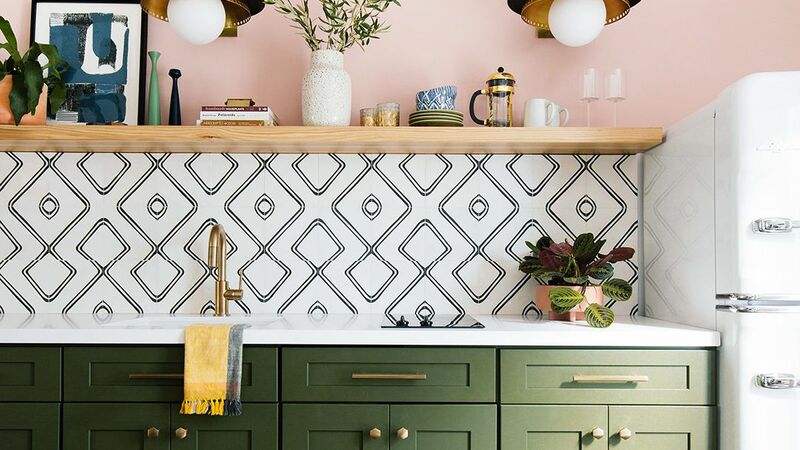 Update your kitchen with a beautiful backsplash. 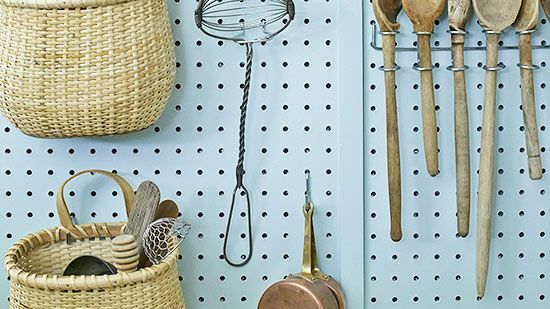 A nook in the corner of the kitchen was already outfitted with pantry shelves, but it got an upgrade with more blue beaded board. 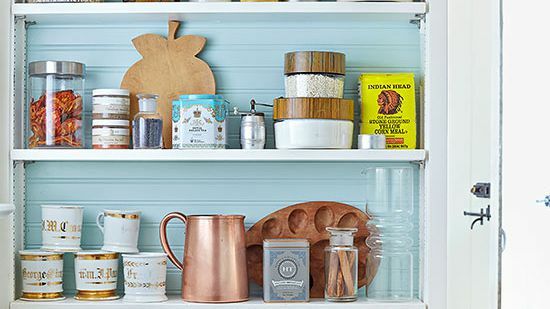 Pantry staples are stored in a collection of 1960s Pyrex with wood lids, as well as glass containers and tins. 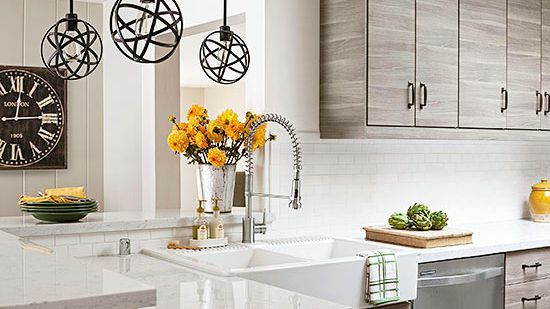 Below, a woven basket fitted with two metal bins is an attractive way to sort recyclables. 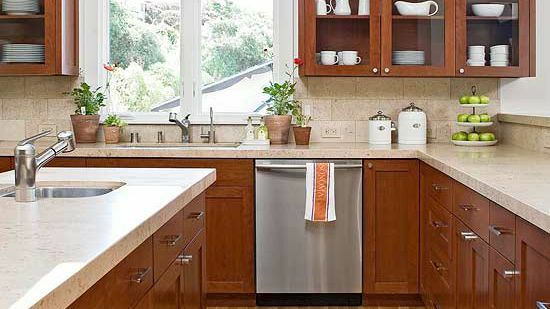 Learn what to consider and look for before you choose wood countertops.